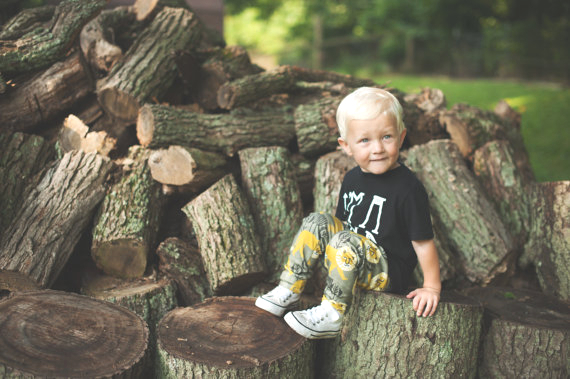 Vivie & Ash is an Indianapolis-based Etsy store that produces adorable, graphic print, organic cotton clothing for boys and girls. The store opened in January 2014, and features headbands, hats, lounge pants and skirts. But it's their range of leggings that has our hearts aflutter as we head into fall and start to think about keeping our little ones warm and stylish. All items in the Vivie & Ash store are designed and handmade by shop owner Sara. She lovingly hand cuts and sews all her items, and the seams are professionally serged for durability. The leggings are made from super soft, 100% certified organic cotton knit fabrics, and the striking and nontraditional fabric designs selected are also printed with low-impact dyes. The bold designs currently available include animals, arrows and abstract patterns, but past collections have included fruit prints and nautical themes, with an olive-toned jungle print and a bear in the woods design pre-ordering for October delivery. Vivie & Ash leggings are available in sizes from newborn to U.S. 4–5 T (and yes, we wish there were adult sizes too!). Care instructions are for simple machine or hand wash in cool water, and they can be air dried flat or tumble dried on low. Prices start from $30 a pair, with a $28 pre-order special on the new season’s range. As well as keeping tabs on the shop through Etsy, you can also follow Vivie & Ash on either Facebook or Instagram (@vivieandash) to keep up to date with coupon codes, special offers, brick and mortar outlets, and pre-orders. All items in the Vivie & Ash store are designed and handmade by shop owner Sara. She lovingly hand cuts and sews all her items, and the seams are professionally serged for durability. The leggings are made from super soft, 100% certified organic cotton knit fabrics, and the striking and nontraditional fabric designs selected are also printed with low-impact dyes. The bold designs currently available include animals, arrows and abstract patterns, but past collections have included fruit prints and nautical themes, with an olive-toned jungle print and a bear in the woods design pre-ordering for October delivery. 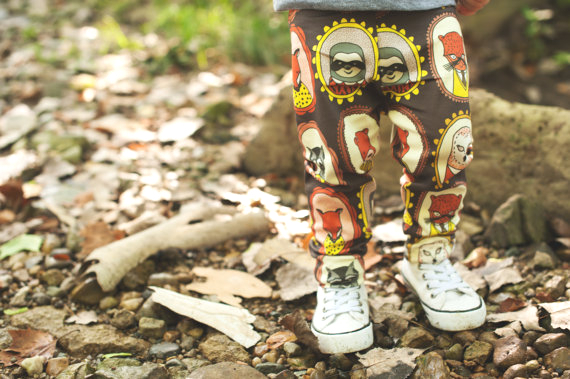 Vivie & Ash leggings are available in sizes from newborn to U.S. 4–5 T (and yes, we wish there were adult sizes too!). Care instructions are for simple machine or hand wash in cool water, and they can be air dried flat or tumble dried on low. Prices start from $30 a pair, with a $28 pre-order special on the new season’s range.